Shortly after Toyota announced that its vehicles would offer cheap crash prevention systems in the U.S., Nissan said Tuesday it would make automatic braking standard in Japan. The decision was announced in a news release about the new X-Trail (the Rogue in America) Hybrid in the country. If Nissan makes the technology standard in the U.S., it could reduce crash volume but incorporate more expensive sensors into the auto body itself, raising the cost of repair. The technology will be required to get a five-star crash rating, Transportation Secretary Anthony Foxx announced earlier this year. The company was the No. 5 brand in the U.S. and the No. 6 overall automaker in 2014 when you take into account multiple makes from the same company (i.e. Toyota and Lexus), according to GoodCarBadCar. The Rogue was the No. 20 model in America last year with 199,199 (really!) 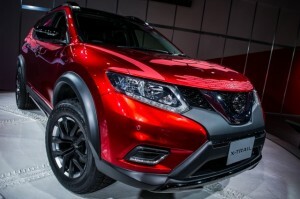 SUVs sold and Nissan’s second-most-popular vehicle behind the Altima. Nissan offered few other automatic braking details Tuesday and said nothing about U.S. plans for the Rogue or the technology.